These deluxe Soul Survivor skeleton gloves are very comfortable to wear and are the perfect match with our Soul Survivor mask. 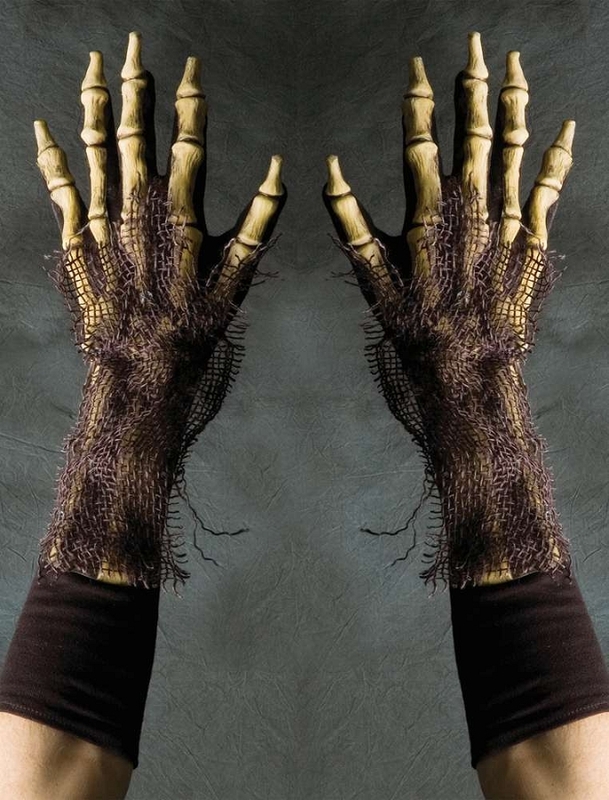 They are black fabric with latex bones mounted to the backs of the hands. Your palms stay cool and it's easier to use your hands because the underside is just fabric. Dark burlap fabric adds a nice ragged look to the hands. A great way to complete a skeleton costume! The gloves fits perfect, I removed the fabric, because it made them look to new,but i can drink from a coffe cup with them on, best gloves i have tested so far. So i can only recommend that you buy them. These arm-length gloves from Zagone Studios are pretty cool. They are quality made and comfortable, and I can imagine wearing them all night long with a costume. The only issue is that they are on the small size, so if you have big hands, you won't be able to wear them. You will want to tear up the burlap fabric a bit to make it look more worn. These are great gloves, they will fit a large hand. I can also put my size 13 ring over the gloves and wares great. Full finger rings will work also. I would highly recommend these gloves. They look very creepy yet they're very comfortable. It's easy to manuever your fingers as it is just like a light glove.